Wow, it's been a few weeks since I've posted! I've been reading and listening a lot, I promise. I'm so excited because we are entering my favorite time of year. The Fall Season. Ahhhh, I would love the heat and humidity to go the you-know-what away. I'm ready for cool nights, spooky movies, spooky reads, drinking wine and making stew. I'm also very ready for the R.I.P Challenge from Stainless Steel Droppings. I've been a part of it my first two years of blogging but not last year. I love it because it revolves around anything spooky or mysterious. Here is the link for you all to check it out. There are many different levels to this challenge. I have chosen two parts because I would like to read and watch something spooky. Peril the Third is to read ONE book from either Mystery, Horror, and Gothic genre(and more sub genres to be found on the link). 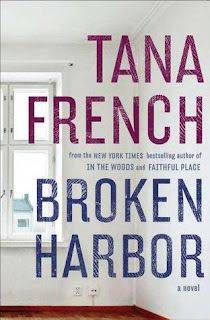 I am chosing Broken Harbor by Tana French, Book 4 in the Dublin Murder Squad. 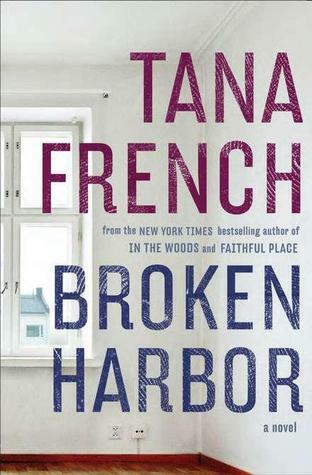 I haven't decided whether to read or listen to it yet but it is definitely on my list for October. It would fit under Mystery/Thriller. Peril on the Screen is the part of the challenge where you pick something spooky to watch. Well, this is a given for me this time of year. I have my favorites definitely but this year I am picking something new that I discovered. Fingersmith by Sarah Waters is one of my very favorite books of all time. It was made into a BBC miniseries a few years back and when I found out, I rushed to order it from my library. It's on its way and I hope it gets here before October is done! check out the link and sign up! I'm seriously thinking of undertaking RIP as well. I was thinking Wuthering Heights and some short stories by Shirley Jackson and then a couple more modern things. I also want to revisit Alfred Hitchcock, Rear Window, Dial M and The Birds from Netflix. I think I'll sign up tomorrow. I am going to join in after Thrill Week. Great to have you back this year! "I'm ready for cool nights, spooky movies, spooky reads, drinking wine and making stew." I have to say, I'm ready for all that as well. It cannot come quickly enough for me. But even while waiting I am enjoying embracing the spirit of that time to come with some good mysterious reading.